It’s officially here: one of the best months of the year! November has made it Uptown and with it out comes the gloves, scarfs, sweaters and our own Coyote Cash that’s ready to share his stolen wins with you! 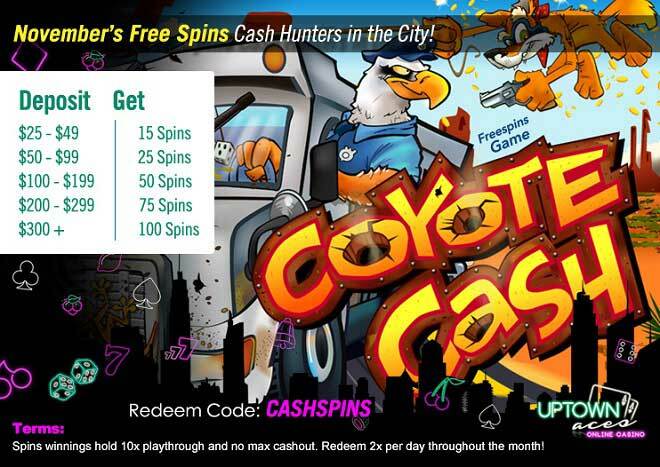 And not your ordinary, every day Uptown wins – Coyote Cash wins! Deposit as little as $25 and you’ll be spinning the reels of the hilarious slot where an American Eagle Sheriff and Rattlesnakes are all after your cash but the big Uptown wolf is hanging on to them in your behalf! Celebrate the start of November with fun winning times and take your wins out for up to 100 Free Spins!